How much does packaging affect our drinking experience of beer? I’m a sucker for attractive packaging and interesting design, even if I sometimes feel like I look at things a little too objectively, rather than simply letting the form wash over me and have its intended effect. I’m very much a constructive criticiser rather than passive appreciator. I look at a corked and caged bottle of imperial stout and recognise it as something more than a bottle of beer, it’s a representation of how much care has been put into the product by the brewer, a big flashing neon sign that says “we think this beer is special”. But is that the desired effect? Or does the brewer simply want to change the way the customer drinks the beer, or perhaps I’m being cynical here, simply get a bigger mark up on their beer? At the other end of the spectrum, another way to increase your profits is to produce a beer which has the appearance of something which you can passively drink without too much thought, a beer which is for everyday drinking - ‘fridge beers’ as I call ‘em. Without changing the flavour of a beer some breweries will try to change our overall perception of it through packaging, with the desired end-goal of encouraging us to drink more of it. The most obvious way this is done is through the use of cans in craft beer. It just screams “drink me now, drink me cold”. There’s just something about a stubby little 330ml can that encourages you to drink the beer immediately rather than save it, simply sup it and then crack open another – no bottle caps, no mess, no fuss. Hell, drink it straight from the can if you like. It was the can of Flying Dog’s Snake Dog IPA sat in my fridge that got me thinking about this. Even at a not-exactly-session-strength 7.1% it strikes me as an everyday drinking beer because of the packaging – a lawnmower beer the Americans call ‘em – something which is there to be drank and enjoyed rather than savoured and obsessed over. But it isn’t just the switch from bottles to cans that has this effect. 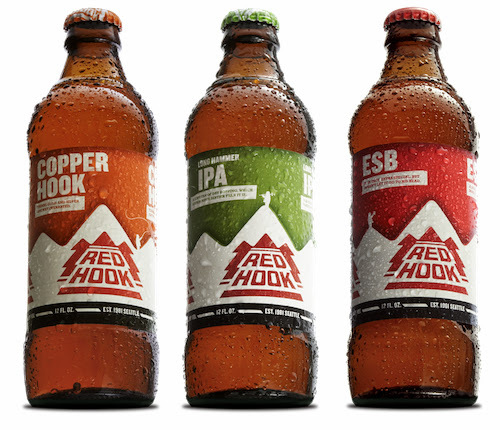 There’s something about the stout, no-fuss shape of the American Red-Hook bottles that implies they aren’t ‘fancy’ beers (Camden’s 660ml bottles have a similar aesthetic). The shape and branding implies that these are beers brewed to be drank and enjoyed, but there’s no need to make notes. It’s an impression that carries over to my experience of the beers themselves, but is that a residual feeling left over from my perception of the packaging, or has the bottle design been chosen to suit the no-fuss, drinkable style of the beers? How much can we really separate the impression given by the packaging, branding, history, from the flavour of the beer itself? Isn’t it all one experience, no matter how objective we try to be? On the flipside, look at the shape of Meantime’s bottles. Slender necked, elegant, very un-beer-like in many ways, they shout at you to pour the beer into a stemmed glass and take your time. In fact they are even cleverer than that, with that long neck and fat bottom making it awkward to drink the beer direct from the bottle - something which would not suit the brand at all. 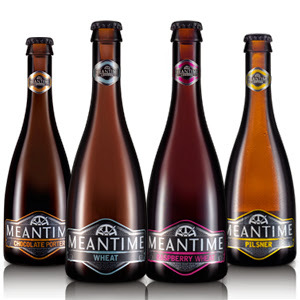 And, lone behold, my honest impression of Meantime beers is that of subtle refinement. Not shouty, not always exciting you could argue, but always good quality, with a sense of class that other breweries don’t often achieve. The interesting question for me is how much do you notice packaging in beer? 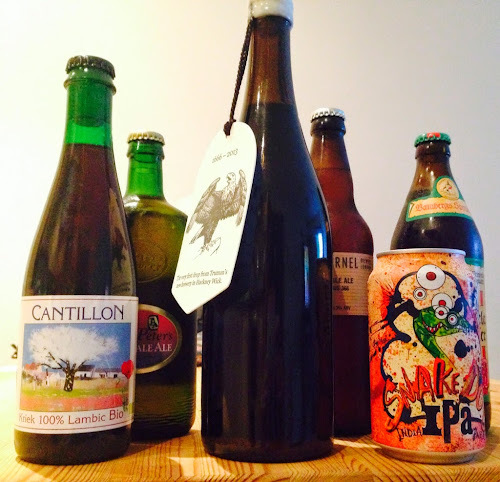 Not just the obvious gift-boxing of expensive beers, but the subtlety of shape, form and branding of the bottles. Because if you don’t notice it, then it may be having even more of an effect on you than you’d think. I tend to look at packaging from a utility point of view. If its a bottle I'm drinking at home by myself I prefer a 330ml (less beer wasted if its a drain pour). If its something I know I enjoy I may go for a 500. 750ml bottles are great for sharing or having on the dinner table. 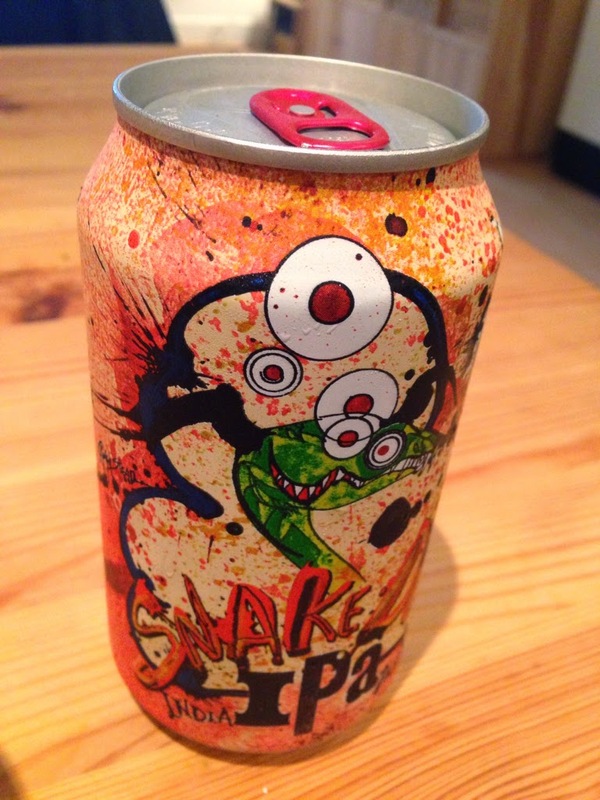 Cans are perfect for festivals and picnics where glass isn't practical/ banned. I like unusual bottles, quirky shapes are all part of the overall brand aesthetic and help the beers to stand out on the shelf. Its not as important when ordering beer online. Sometimes I get surprised by unusual packaging because I didn't bother to look at the picture online (By the Horns deadly sins series for e.g.). Yes undoubtedly some breweries do use packaging as a ploy to charge a premium, its another string in the pricing strategy bow, after all they have to make money somehow and margins are slim in the bulk game.